I don’t think many words are necessary here. A look at the Pen Pal wallpaper by Mr Perswall should be enough to sell the concept to you. 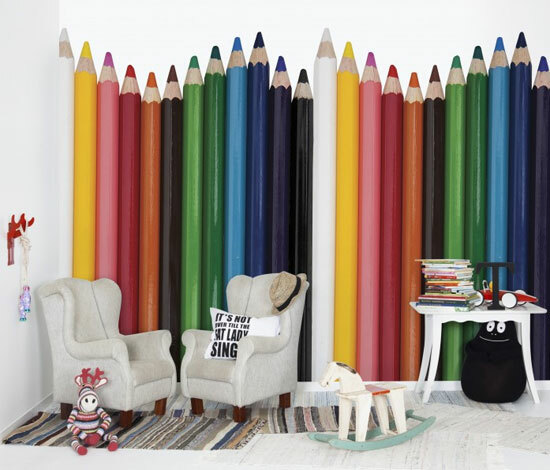 It’s a line of brightly-coloured pencils, which is perhaps more of a mural than a wallpaper. Either way, you can get it ‘off the peg’ as a 180cm x 265cm image or you can opt for a customised image if the wall you need to fill doesn’t fit those measurements. The end result is what you see above, a room instantly brightened up and quite possibly, the envy of your child’s school friends. We first spotted it on the Nubie site for £128, but it is also on the Wallpaper Direct site a little cheaper, selling for £11 there.